I’m pretty sure I’m actually about three times my age. The main points of evidence here are, first, I spend too much time playing backgammon and, second, I spend two much time knitting. Seriously, I think I spend more time either playing backgammon or knitting (or baking bread) than most other 20-somethings combined. I CANNOT STOP. We received a backgammon set for Christmas, and after a few days of balking at learning a new game, I gave in and quickly defeated Derek in our first few games. HA! Naturally, that made me instantly like the game. Now I have a backgammon app on my phone, so when I can’t convince Derek to play with me IRL (in real life, duh), I play against my phone. At first, when I had the difficulty set to “medium,” it was pretty fun! I’d win some, I’d lose some, but I had fun no matter what. Then I switched the difficulty to “hard.” BIG MISTAKE. It’s not that i’m ill-prepared for an experienced backgammon opponent, it’s that MY PHONE IS A CHEATER. Seriously! I’m no PhD statistician, but I am POSITIVE that it is statistically impossible for the app to roll the way it rolls EVERY. SINGLE. TIME. In order to make it harder, they’ve just given you an opponent who can control their dice and ruin you every time! Totally not cool. So now I just spend my games being frustrated at the lack of integrity in my iPhone. I actually got so irritated with it yesterday I switched back to medium difficulty. I feel slightly defeated, but at the same time — I don’t want to play against a cheating computer! All of this makes me stress-eat cookies en masse. 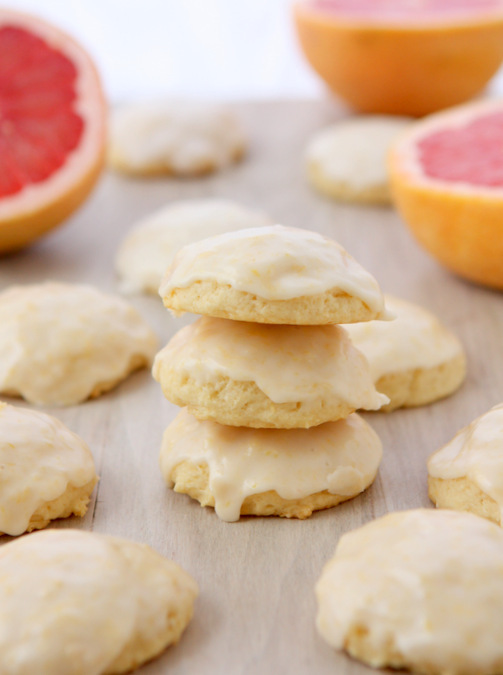 I saw this recipe for orange ricotta cookies on Pinterest a few weeks ago, and had a last-minute stroke of genius to make them grapefruit instead! 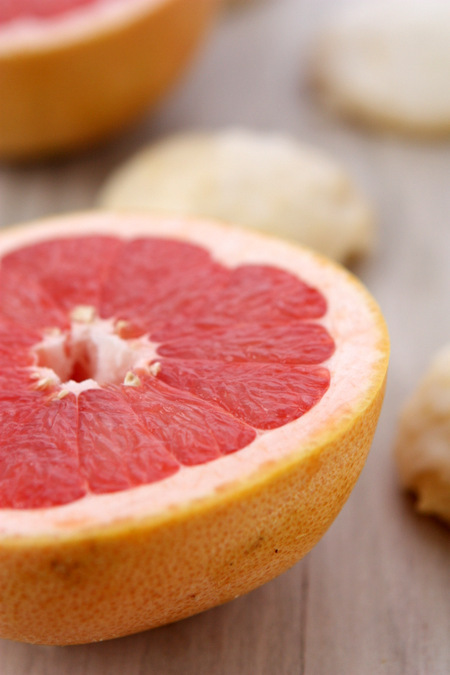 I LOVE grapefruit desserts. When I first made grapefruit curd a few years ago I thought I’d discovered the elixir to life: it is nothing short of amazing. My mouth is watering just thinking about it! These cookies are right up there — flavorful, fluffy, moist, and absolutely perfect if you don’t want a sink-in-your-stomach dense cookie. That’s what the New Year is all about, right? Light cookies that make you feel like you ate something fruity! Done. Consider this a health-cookie (not). Combine the flour, baking powder, and salt in a bowl. Whisk well and set aside. 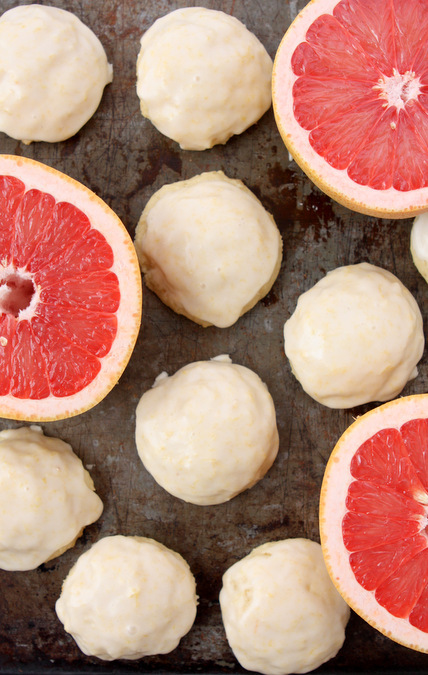 In the bowl of a stand mixer, combine the butter, sugar, and 3 Tbsp grapefruit zest. Beat for a few minutes, until light and fluffy. Add the eggs, one at a time, scraping down the sides of the bowl as needed. Add the ricotta and vanilla, and beat until combined. Slowly stir in the flour mixture, until just incorporated. Scoop batter onto a parchment-lined baking sheet in about 1/8 cup-sized balls. Bake for 20-22 minutes, or until the edges are just barely beginning to brown (really almost imperceptible!). 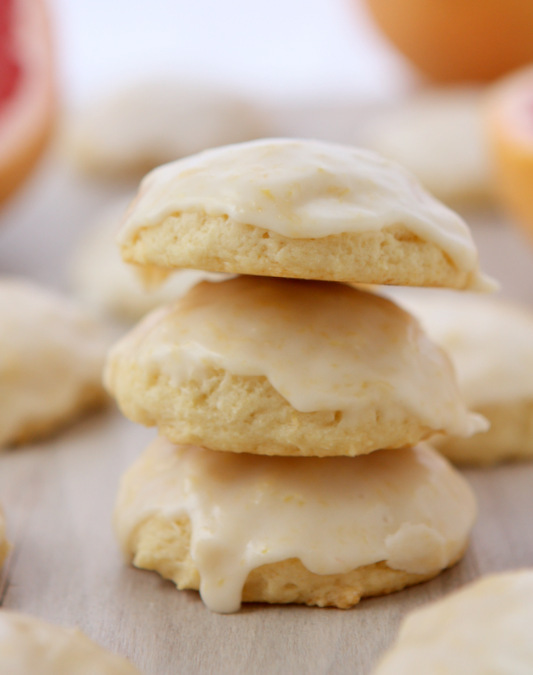 Let the cookies cool completely before combining the remaining Tbsp of zest with the grapefruit juice and powdered sugar, stirring well to make a glaze, and glazing the cookies. You can either drizzle the glaze overtop, or dip the tops of the cookies into the glaze. i love grapefruit and ricotta. these sound great!